EVANSTON, Illinois, January 25, 2011 (ENS) – Extinction cascades are often observed following the loss of a key species within an ecosystem. As the system changes to compensate for the loss, availability of food, territory and other resources to each of the remaining species can fluctuate wildly, creating a boom-or-bust environment that can lead to even more extinctions. New research at Northwestern University has found that more than 70 percent of these extinctions are preventable, assuming that the ecosystem can be brought into balance and no new factors are introduced. 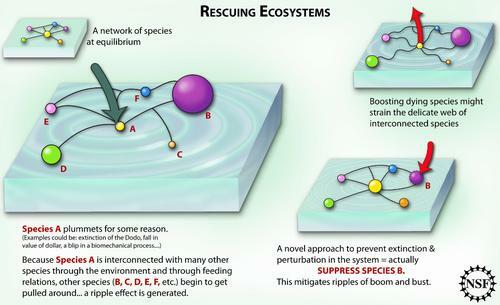 Northwestern University physics professor Adilson Motter and his student, Sagar Sahasrabudhe, have developed a mathematical model to describe interactions within ecological food webs that could rescue fragile ecosystems and halt complex cascade events. Published in the January 25 issue of the journal “Nature Communications,” their study illustrates how human intervention may be effective in species conservation. “Our study provides a theoretical basis for management efforts that would aim to mitigate extinction cascades in food web networks,” Motter said. The scientists found evidence that some extinctions are caused not by a primary disturbance but as the result of a cascade. “We find that extinction cascades can often be mitigated by suppressing, rather than enhancing, the populations of specific species,” he said. Motter and his team conclude that large-scale failures can be avoided by focusing on preventing the waves of failure that follow the initial event. The finding may seem counterintuitive to conservationists because suppressing a species seems to inflict further damage to the system. However, when the entire ecosystem is considered, the effect is beneficial, Motter says. This news holds promise for those charged with maintaining Earth’s biodiversity and natural resources and some man-made disasters such as the Gulf of Mexico oil spill. “In numerous cases, it is predicted that even the proactive removal of a species that would otherwise be extinct by a cascade can prevent the extinction of other species,” Motter explained. The goal of this project, funded by the National Science Foundation’s Division of Mathematical Sciences, is to develop mathematical methods to study dynamical processes in complex networks. Although the extinction cascade application may be useful in management of ecosystems, the mathematical foundation underlying the analysis is more universal, Motter says. This approach could apply to biochemical networks to slow or stop progression of diseases caused by variations inside individual cells. It could be used to manage technological networks such as the smart grid to prevent blackouts. It can even apply to regulation of complicated financial networks by identifying key factors in the early stages of a financial downturn, which, when met with human intervention, could potentially save billions of dollars. Trying to mathematically explain a network, especially when the network evolves within an environment that is itself changing is a complex endeavor. 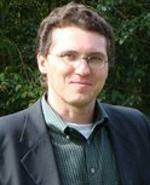 But Motter says his mathematical model is promising for the study of changing environments.